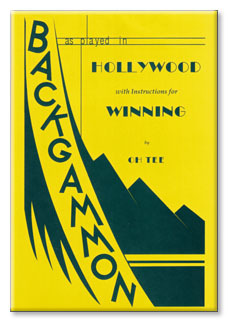 Backgammoon as Played in Hollywood, with instructions for winning was originally published in November 1930, under the pseudonym Oh Tee. The true identity of Oh Tee is not known. Prior to this facsimile hardcover, no known bound copies are believed to exist. This new edition has added Table of Contents, List of Illustrations, and additional information on the dust jacket. Originally published by Earl Hays Cinema Press, Hollywood, California. COVER: A conncise, helpful summary of methods of play, with modern scoring and doubling. Also arrangements for home groups of any size and for larger, progressive parties. Practical suggestions for winning which every beginner should profitably employ.